Rice’s Energy and Environment Initiative is reaching out to university faculty for new ideas about interdisciplinary research collaborations that could attract significant government and industry support. Committee members are energy economist Kenneth Medlock of Rice’s Baker Institute for Public Policy, computational mathematician Maarten de Hoop, Earth scientist Alan Levander and EEI Executive Director Charles McConnell. Launched in 2012, EEI strives to draw experts from every corner of the university to work with industry to overcome barriers to energy sustainability. Shamoo said the protracted downturn in energy markets has made it difficult to attract industry dollars for sponsored research, but EEI is constantly on the hunt for internships, workshops and other opportunities for Rice faculty and students to meet and engage with industry. Shamoo praised McConnell and outgoing faculty director Ramon Gonzalez for building upon the more than $40 million in energy-related research that Rice conducts each year, and he said EEI’s new leadership team plans to both continue that work and engage faculty with environmental interests. Gonzalez, professor of chemical and biomolecular engineering, will head up a new advanced biomanufacturing initiative. For example, Shamoo said, the committee wants to build on EEI’s notable 2015 successes: the Nanotechnology Enabled Water Treatment Center and the Subsea Systems Institute. “Seed funding from the Energy and Environment Initiative was instrumental in Rice winning the five-year, $18.5 million grant from the National Science Foundation last August for NEWT,” Shamoo said. NEWT, which will be eligible for a five-year extension in 2021, is Houston’s first NSF Engineering Research Center and only the third in Texas in nearly 30 years. NEWT is headquartered at Rice and is a collaboration with Arizona State University, Yale University, the University of Texas at El Paso and more than a dozen industry and government partners. McConnell said Rice faculty could also begin to see substantial research support from the Subsea Systems Institute in the coming year. A collaboration among the University of Houston, Rice and NASA Johnson Space Center, the Subsea Systems Institute is a Houston-based national research center that aims to develop transformative technologies, engineering and operational practices to safely and sustainably produce deep-water offshore energy. The institute was established in January 2015 with initial funding from the state of Texas and is expected to attract substantial federal support over the next decade from the RESTORE Act trust fund. McConnell said the institute is seeking input from both industry partners and the research community prior to issuing a call for research proposals later this year. In spite of low energy prices, McConnell said, there are still opportunities for Rice to partner with industry to develop new technology. Shamoo said EEI’s advisory board will provide strategic guidance to the new operating committee. 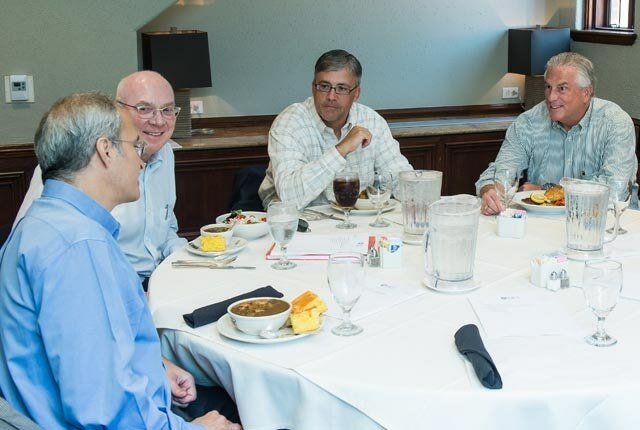 Advisory board members include Rice deans Ned Thomas (engineering), Peter Rossky (natural sciences) and Peter Rodriguez (business), as well as NEWT Director Pedro Alvarez and Dominic Boyer, director of the Center for Energy and Environmental Research in the Human Sciences. Medlock is the James A. Baker III and Susan Baker Fellow in Energy and Resource Economics and senior director of the Center for Energy Studies at the Baker Institute and director of the Department of Economics’ master in energy economics program. De Hoop is the Simons Chair in Computational and Applied Mathematics and Earth Science, and Levander is the Carey Croneis Professor of Earth Science.